A few years ago we discovered the ultimate, most incredible stocking stuffer. The solution for kids to continue believing in the magic of Santa Claus. The best gift for kids on the cusp of Claus. Enter the Chocolate Santa aka Secret Santa Notes. Deborah Torr is the owner, chocolatier and head Elf at Coco Organic Chocolates in Toronto. Here’s how it works. You write a personalized note from Santa to your kid and email it to her. Deborah and her elves hand write the note (guaranteeing handwriting your kid hasn’t seen before). The note from Santa gets rolled up – and here’s the magic part – gets sealed inside of a hollow chocolate Santa. 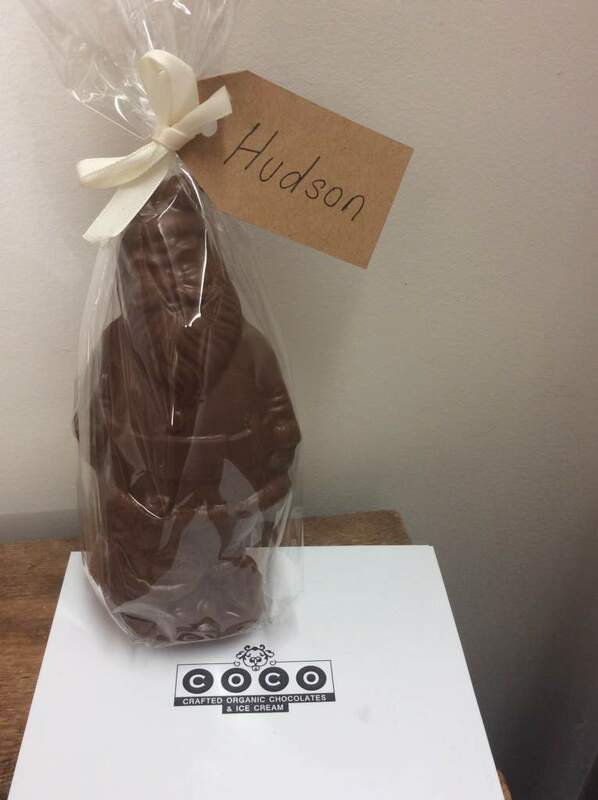 There is no marking on the chocolate Santa other than a handwritten name tag. There isn’t any packaging to indicate this came from a store. And the fact that the chocolate is AMAZING is bonus! The email my husband and I write is highly personalized to our kid and reflects what’s been happening lately, whether it’s good or not so good. One year he and his best friend had a little fight and Santa wrote “How disappointed he was to see him fight with his friend”. Our kid was almost in tears. He’s a smart kid and loves Christmas and believes in Santa Claus. Chocolate Santa helps keep that magic alive in our home. Click here for more information. Hurry! You have until December 10 to place your order for a milk or dark chocolate Santa.